The draws for the eighth consecutive Gothenburg Racketlon Open to be held next weekend have now been published on the tournament homepage. And the Engine has been updated to be consistent with the draw after several changes to the class allocations. Tournament director Håkan Granberg with team have made a great effort to squeeze in as many as possible in the tight timeplan and - although there are still some names on the wait-list; 127 admitted entries is a record number. It's more than at any of the previous seven occasions, three World Championships (2001, 2002 and 2003) included. The Ladies' Elite is small but strong. With Lilian Druve (who officially retired from travelling on the tour in the beginning of 2007) and Linda Jansson present it contains both of Sweden's former Racketlon world champions on the ladies' side. The other two players taking part in the round robin format are Switzerland's Nicole Eisler and Anneli Andersson. Eisler won the Women's B Class at the Swiss Open a few months ago and Andersson is a Gothenburg raised, first class badminton player that have now gained considerable Racketlon experience. Linda Jansson and Lilian Druve. Two former Racketlon world champions honour the 2008 Gothenburg Racketlon Open. Include Peter Bittár, the current veteran world champion and it makes three. The Men's Elite is a tasty 32 draw including no less than 5 of the top 10 on the world ranking. And an additional 4 of the top 20 including Stefan Adamsson - the winner of the prestigious English Open two months ago. Christian Wall - the defending champion of the last two years! Wall is a former professional tennis player and has repeatedly shown that he can play a very tight game, giving away very few points, when he has to. One example is his semifinal against Adamsson in the 2006 Gothenburg Open; Adamsson needed 13 in tennis to win the match and when Wall was down 7-9 it did not look good for him. But then he just stopped losing points and turned those 7-9 into 21-11(!!! ), thereby winning the match by one single point (see full report from the 2006 Gothenburg Open). Another example of a spectacular comeback came at the 2007 German Open (see report to remember the Gummiarm quarterfinal against Schaub). One more of those and people will start calling him "the comeback kid", surely. Defending champion Christian Wall in his favourite sport. 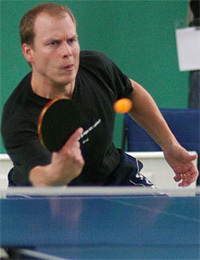 Mats Källberg - a Swedish Championship runner-up in 2007, and a World Championship runner-up in 2002 (see results) - often recognised as the best table tennis player on the tour. Be sure to watch one of his favourite shots in this video! Again, don't miss it! Källberg has not played much on the tour lately and has therefore quickly slipped down the rankings. Consequently he will, unusually for him, not be seeded in this tournament. Joachim Nilsson - has not played many Racketlon tournaments lately but is certainly a player to keep an eye on. Half a year ago, in a small tournament in his hometown Karlstad he shocked the Swedish Racketlon community by beating Christian Wall in the final +3 (21-11, 12-21, 21-7, 7-19). Surprisingly, however, if records are studied one will find that this is not the first time he has had a tight encounter with Wall. And Wall is not the only one that has reason to worry when the games begin. Incidentally, all three of the above "challengers" have ended up on the lower half of the draw. Källberg will face O'Donnell in the first round(!) while Wall seems certain to face Adamsson in the second round in a revenge repeat of the semifinal of the 2006 Gothenburg Open mentioned above. Nilsson, finally, will take on seed 5 Johan Porsborn. (1) Peersman will have to watch out for a player that have not been seen much on the international tour - but did make an impression in a Swedish Racketlon context at the turn of the century by e.g. beating Peter Bittár. His name is Per Vasilis and should turn out to be a good match for table tennis specialist Peersman in his favourite sport given the fact that he is a former junior team European Champion for Sweden and also played professionally in Germany for a while. This was some time ago, however, and it remains to be seen to what extent he has kept this superior shape. Vasilis turned veteran this year and will in parallel, for the first time, give it a go in the veterans' class. Watch out for good table tennis at 15:15 on Saturday afternnoon - provided that both players survive the first round. (2) Persson will face a familiar name in the first round that have not attended any elite events for a while; Peter Bittár. He is the veteran world champion from Rotterdam a year ago and is sometimes described as "the Eliasson of the Nineties" given his 6 Swedish Championship titles back then. Bittár is now preparing to defend his world title in Germany at the end of November - and is well known for his fighting spirit. Köpf, on the other hand, will be challenged by reliably performing, and often underestimated, Anders Rickan. Rickan is famous for regularly being drawn against world no.1 Magnus Eliasson in one of the first rounds - a fait he was certain to escape this time since Eliasson is not attending Gothenburg this year. Will he grab this golden opportunity? Peter Bittár. The current Veteran World Champion. (3) As implied above the third quarter offers a spectacular first round clash between O'Donnell and Källberg. This will be the match to watch in the first round; Saturday morning 10:30. It will be a show-down between two very different "Racketlon profiles"; Källberg should win tt and te easily while O'Donnell will be having similar plans in ba + sq. Badminton should become key. To win overall O'Donnell will probably need to find his winning "in the zone" game there. On the other side of the quarter unseeded Nilsson will take on seed 5 Johan Porsborn. (4) The fourth quarter, finally, also looks very strong; second seed Weigl is scheduled to face the winner between Adamsson an Wall. 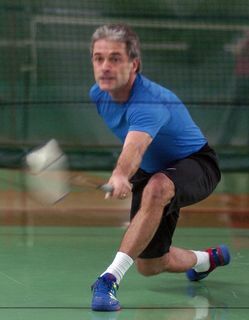 Provided that he survives the first two rounds; A bit of a surprise could be waiting for him in the first round in the shape of Andreas Carlberg, a product of the vintage Karlskrona Racketlon community and the winner of the Karlskrona Open this summer, where he took prestigious victories over players like Håkan Granberg and Henrik Håkansson. We welcome over hundred players from 11 countries to the eighth Gothenburg Racketlon Open - and the home of International Racketlon!